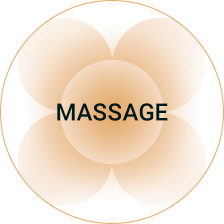 Amy has been a Registered Massage Therapist for over 15 years. She graduated in 2003 from the Metro Community College and in the summer of 2018 graduated from the Alberta College of Massage Therapy, completing 2400 hours of formal training. She is a member and in good standing with National Health Practitioners of Canada. She has additional training in bamboo massage, cupping, Quantum Touch Theta Healing, pre-natal massage and deep tissue massage. In my free time I love to “train to feast.” I love being active, going to the gym, playing sports, but I also love cooking and creating different foods and sharing that with my loved ones. Earth is the element that resonates and relates to me. I’m most in my element when… I’m free to give and serve others unconditionally.